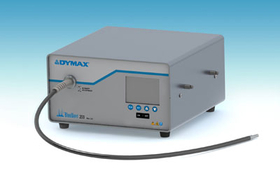 Dynamax Corp. has released a BlueWave 200 spot-curing system for adhesives, coatings and encapsulants. TORRINGTON, Conn.—Dymax Corp. has released a new spot-curing system for adhesives, coatings and encapsulants that the company claims offers high intensity and is user-friendly. The BlueWave 200 version 3.0 features an automatic, controlled power-up sequence that the firm said ensures proper lamp operating temperature to minimize scrap. Its faceplate design, with a large LCD graphic display, has an improved operator interface for easier setup, programming, and operation. The patented intensity adjustment control can be found on the faceplate, which is critical for validating appropriate intensity levels and maintaining those levels during production. Users can adjust the unit's intensity output to accommodate for bulb degradation and other factors that may affect process repeatability and consistency. The unit contains an integral shutter that can be actuated by a foot pedal and a universal power input that allows for global operation and performs at any voltage. A wide range of light guides in various materials and configurations are available. For additional information, visit www.dymax.com.